I found a free Android app that lets me create memes for posting on various social sites. One of the myriad templates is the philosoraptor with the following text offered as a sample: If Satan punishes the evildoers, wouldn’t that make him a good guy? That question made me sit back and think. (I love when that happens, by the way!) The only logical answer would have to be "Yes". I have always heard that Satan is the enemy of God and stands against everything God is for. Since God orders the eternal punishment of people who don’t believe in Him, then why would Satan follow that order if he was The Bad Guy? According to Christian doctrine, Satan and Hell are a special creation of God to punish people who don’t believe in God. Christians believe that people who don’t believe in God are enemies of God, just like Satan. So….what possible reason could there be for Satan to torture those billions who should be his steadfast allies in his fight against God…..unless Satan is on God’s side? If Satan is indeed the rebellious opposite of God, then Satan would have to be very much AGAINST eternal torture and would absolutely refuse to engage in it simply because God wants him to do it. God could send everyone ever from anywhere to Hell and Satan would not harm them if he were indeed the enemy of God. But if Satan is doing God’s work by following God’s orders to torture people then Satan is God’s muscle, not his enemy. Therefore, Satan is a good guy. 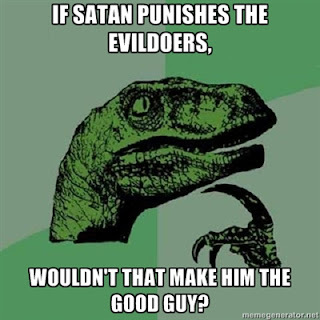 If Satan punishes the evildoers, wouldn’t that make him a good guy?